Starting Sunday! Sailing Daily For Sea Bass Weather Permitting - Saturday's 6:30 to 3:30 - $125.00 – Otherwise 7 to 3 at $110.00.. 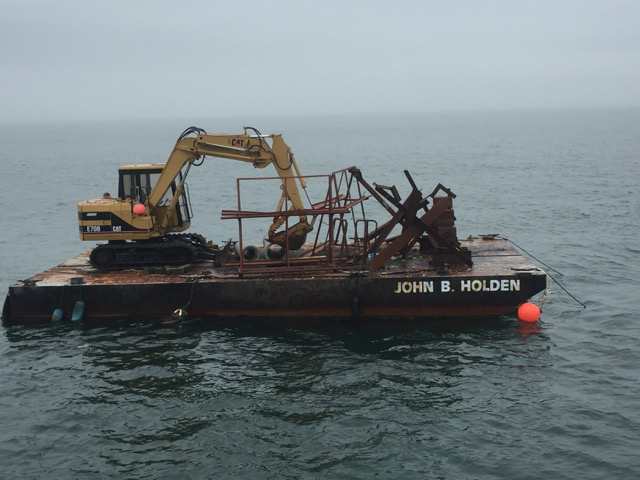 The Ocean City reef Foundation's barge made a run on Thursday, May 12th, to Ake's Reef at Great Gull Shoal. Already a toggy place; now more so after these Parkside welding class units were pushed over. Some of these reef units were truly top-shelf! Dan & Wes rigged and deployed two 85 pound Danforths on 1 inch nylon 3-strand from my boat's transom. The orange poly-ball you see is the center of their anchor rig. The deployment went perfectly; landed exactly where I'd envisioned it. These types of deployments, & the blocks we drop every day while fishing, add up over time. Fundraising usually outpaces these small projects. When enough is saved, we'll hire-out for a larger series of deployments. The largest of these was the Iron Lady project in 2015. Our annual reef dinner is Sunday, May 15th, from 4:30 to 7ish at the OC Marlin Club. We have, by far, the most wonderful collection of donated gifts for our silent, chinese & live auction ever -- EVER. I'm telling you -- EVER!!! If the Iron Lady becomes available in the fall of 2016, and it should, I hope to build some serious new reef ..all depends on what's in the bank. Wow! Went Fishing Three Days In A Row Last Weekend!! Little cynical there.. Everyone, everywhere, and everybody is sick of the weather. Case in point: we primed our waist cap & scuppers 19 days ago. There has been no opportunity to apply finish paint since. It appears as though we may fish all summer in primer.. When we did get out fishing though, the tog bite was mostly ferocious. One youthfully minded permanent resident of the amateur toggin circuit, (code name: Grandpa) was even done by 9:15 Monday morning.. Tagged mad sea bass too - real, real close to the Maryland Wind Energy Area. (MD WEA) We're already catching sea bass better, on crab, than we did last spring on clam. I have written many times this winter that I anticipated last summer's sea bass disaster to carry into spring. Last summer nearby reefs outside & inside the WEA had no sea bass - none. Back to back to back years of survey work with sub-bottom profilers (a type of bottom sounder) for wind towers drove sea bass & flounder mad--made them leave. This is video we shot at the end of August. If we had fished reefs down like that, down to nothing; if we had caught sea bass that heavy ..oh, wait. Actual recreational fishing doesn't matter. Just the estimates. Point is, we've already been catching sea bass better, on crab, than we did last spring---even where I did not anticipate catching any. Have tagged them up to 19.5 inches..
Last May was the worst spring sea bassing I've ever seen - ever. There were just a handful of spots with decent fishing. It was much better in June than in May. I had never seen that before..
Judging by the sea bass we've been catching while toggin; this spring will be much better & across a broader area. Last tog trip today; Saturday, May 14th; probably could have limited the rail but, clumsily, kept dropping large females back. Some fellows might have limited on sea bass had it been open.. Very different than the last few weeks..
Had a Coast Guard inspection on Friday the 13th. Made a reef deployment the 12th. All the while gathering & collecting donations for the reef dinner. Also went to Baltimore for a habitat & ecosystems advisory panel meeting last Wednesday. Like Charlie Brown with Lucy holding the football, I always think this time will be different..
And you know, it might actually be. Sure seems like a lot more interest in our nearshore corals. Really does. I put this video together https://www.youtube.com/watch?v=-cMC8JVa2Bk for the MAFMC's renewed habitat effort 5 years ago. I stand by all of it. Could add more to it - lots more. (but my work's boring enough! Good fishing's not boring though..) There are actually people asking about these corals. People in management. I apologize for not filming tube worm colonies. Had a chance. Didn't. Haven't seen tubeworms dense enough to form reef since.. ? 2004 or 2005? Was an area of tubeworm north of the Jackspot in 120 feet of water, where, for instance, I could fish 75 people once or twice a week all summer long & catch cbass. Tube worms make a "soft reef" as opposed to hardbottom. In 2004 (? ..have to look it up!) I saw trawlers working there..
From that day to this - no more sea bass. Never marked anymore tube worm either..
Was it the trawlers' fault? Or a management system that claims catch restriction alone will see it through to success.. I tell you - we do not yet understand our task in fisheries restoration. Understanding habitat & spawning biology mean nothing today. With an understanding of habitat & spawning production, we could take some species higher than any now dream. I think sea bass top that list; but, at the moment, suffer greatest in management's ignorance. Been trying to fix that. I consider sea bass & tautog the easy part. Marlin restoration on nearshore grounds will be incredibly more difficult. Those same people have no idea the ocean grows greener by the decade, or grand numbers of marlin once swam along the Mid-Atlantic in plain sight of shore, or corals in anyway play a part in temperate seafloor & fisheries restoration strategies---they think the easy part is impossible & have no idea restoration's true difficulties.. The hard part; and, even at the habitat & ecosystems advisory panel meeting where habitat wonks gather, my larger marine water quality concerns are taken as over the top: I believe the ocean's turning green. If we do not soon put oysters back to work as biofilters in industrial scale, we'll lose a fantastic amount of nearshore fisheries production. Damn sure it's a lot greener each generation. I'd sure hate to find out how green is too green. I used to say: Reef Restoration Makes Fisheries Restoration Simple.